Glasgow Punter: The Beat and The English Beat. But Which Is Better? The Beat and The English Beat. But Which Is Better? Despite being just too young to catch the 2-Tone bands in their prime I've always had a love of their music. My parents, I suppose, introduced me to The Specials but every child of the 1970s fell for Bad Manners and Madness on Top of the Pops. Once you got into it you would find The Selecter, The Bodysnatchers and start drifting towards the original Jamaican ska and reggae that these musicians were often covering, particularly Prince Buster. So I was old enough to see them on telly and to buy their music but by the time I was old enough to go to their gigs they had largely chucked it. They emerged at a time of skinheads and Margaret Thatcher and came across as a bunch of people from ordinary backgrounds just getting along and having fun (the reality was often a bit different). There are few live gigs better than a full blooded ska band, two hours of skanking should become the next fitness craze. Excellent Glasgow ska bands Esperanza or The Amphetameanies could maybe lead the way by creating a fitness DVD. When The Specials and The Beat called it a day, some of them weren't ready to pack it in yet and when I was at Glasgow Uni they played the QMU as The Special Beat, with Ranking Roger, Horace Panter and Neville Staple amongst others. I had also seen Madness in the days before they dis-banded first time around, but the gig at Ingleston in 1992 has to go down as one of the worst concerts I've ever been to. First up were support acts 808-State and The Farm. Then, before Madness came on stage a battle broke out between various gangs that were in attendance: skinheads, ICF and Hibs Casuals. This involved scaffolding poles, chains and broken bottles. It seemed to take forever for order to be restored, whilst we all ran left and right, trapped inside the main Ingleston hall. Eventually once Madness came on, the hall lights were kept on throughout, they battered through a quick set and went off. The more successful ska gigs I went to were in smaller venues in Glasgow. In the more intimate setting of King Tuts I've seen a lively Neville Staples solo set whilst in contrast Terry Hall hid behind an amp for half the show as he sang his melodic solo stuff. The Selecter have played on and off over the years and I've seen them a few times put on a great show. With frontwoman Pauline Black (whose recent autobiography is a great read) they recently played in Oran Mor, a mixture of old and new material. Bad Manners have been touring since 1976 and always put on a barnstorming show and I even went to the recent Specials re-union at the SECC. Now they've got a taste for it they are back at the Barrowlands doing two nights later this year. Jerry Dammers is the one performer that I've never seen doing his ska/ 2-Tone numbers. I saw him perform as ringmaster in the concert to welcome Nelson Mandela upon his prison release in Wembley, London. The other time I have seen him live was fronting an 24 piece band in tribute to the Sun Ra Arkestra, as Jerry Dammers' Spatial A.K.A. Orchestra at the Usher Hall in Edinburgh. It was a great night, if slightly bonkers. It was the political edge that Jerry Dammers brought to 2-Tone that appealed to me too. This was evident in the "2-Tone" name, the multi-racial make up of the bands and the many international influences in the music. The songs were often political too, in the sense that they were often about real things affecting people: teenage pregnancy, inner city violence, "too much fighting on the dancefloor", "Stand Down Margaret", Rhoda Dakar's anguished "The Boiler". This of course reached its zenith when Jerry Dammers penned "Nelson Mandela". The Beat formed in 1978 in Birmingham. The original line up was Ranking Roger and Dave Wakeling on vocals, with Andy Cox and David Steele on guitar and bass (both later to be found cavorting behind Roland Gift in Fine Young Cannibals), Everett Morton on drums and Saxa (who'd played with Prince Buster, Laurel Aitken and Desmond Dekker) on saxaphone. Their first single was a cover of Smokey Robinson's "Tears of a Clown" and gave them their first top 10 hit. They also found success in the USA (as The English Beat as there was already a band called The Beat there) and Australia (as The British Beat). 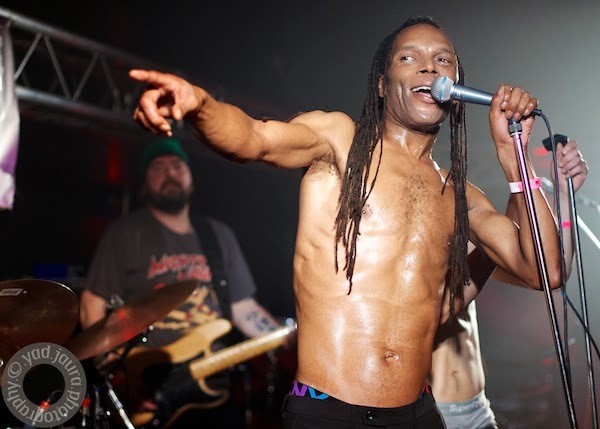 The Beat is now made up by Ranking Roger singing alongside his son Murphy 'Ranking' Jnr, Everett Morton, and sometimes Mickey Billingham on keyboards (once of Dexy's Midnight Runners). Former frontman Dave Wakeling moved to America and now tours as The English Beat. Whether by chance or by design both versions of the band ended up playing Glasgow within a couple of weeks of each other which gave me the chance to decide, The Beat or The English Beat, which is better? There was only one way to find out. First up were The Beat playing the Arches. They were supported by Esperanza, an excellent (usually) 8-piece ska band from Glasgow. Many people had clearly come early to hear them, as the Arches was already filled for their support slot at 7.15pm. They were on stage recently at the Clutha pub on the night that the police helicopter fell onto it, killing and injuring several people, many of them friends of the band. Their sound was as energetic and tight as any time I've heard them before. Next up, Ranking Rodger brought The Beat on stage. Despite it being 20 years since I've seen him live he appears not to have aged, although he has grown spectacular dreadlocks. If any ska bands are considering bringing out a Ska-Fit DVD, he's your man to front it. Like a thoroughbred racehorse without a pick on him he spent the next 90 minutes sprinting left to right on stage, with his son Murphy Ranking Jnr (who has previously featured on the Ordinary Boys song "Boys Will Be Boys") as fellow front man, trying to keep up. Starting with Whine and Grind/Stand Down Margaret (although he suggested it should now be Lie Down Margaret) they worked through all the old hits and a decent ska cover of The Clash song Rock The Casbah. The band were slick, apparently not following a setlist but whatever Ranking Roger decided should be next up, the drumming and beats excellent and there was a laid back chemistry between father and son up front. It was impossible not to dance and I had a smile on my face all night. Next up were The English Beat, four weeks later in the ABC O2 on Sauchiehall Street. They were supported by...Esperanza, which lead to the worrying thought that I might be about to experience a very familiar night. However right from the off it felt very different. The crowd seemed smaller and more of a mixture of ages than were at The Beat (which had attracted more of the old timers). Esperanza were first up and well received. Whilst I enjoyed a chicken and chick pea curry from the catering stall, on stage next were Capone and the Bullets, stalwarts of the Glasgow ska scene in the 90s who have recently reformed. I remember seeing them playing in The Halt bar a couple of times and the fabulous trumpet playing always stuck in my mind. Finally Dave Wakeling and The English Beat came on stage. This was very much the Dave Wakeling show, as he was front of stage on lead vocals and guitar. Accompanied by a competent, if not the most rousing band. I found the drumming really just keeping time and the saxaphone a bit apologetic, whereas it appealed more to my brother's tastes. They are set up as the band originally were, with a stand in for the Ranking Roger role too, but it had less energy than the performance I'd seen a few weeks earlier, more stretching out songs with long solos. That was until Roddy Radiation joined them on stage. The lead guitarist and song writer from The Specials left them last month to "concentrate on solo projects". The direction some of these projects are taking was evident in the versions of three Specials songs he then blasted out, with a rockabilly edge: Concrete Jungle, Hey Little Rich Girl and Rat Race. He then went off stage to return for the final song "Mirror In The Bathroom". So both versions of The Beat were entertaining, but Ranking Roger was the most fun. It was great to see Esperanza performing again after their recent traumas, and Roddy Radiation had all the best tunes.